Please download the application by clicking on the link below. Please send the completed application and two forms of ID's to synchronyfinancial@magnoliahall.com. Feel free to apply over the phone by calling us at (866) 410-2755! Enjoy the magic of more time. Buying now and paying later. With PayPal Credit, you can enjoy special financing offers like this one: No Payments + No Interest if paid in full in 6 months on purchases of $99 or more. Learn more. We still offer the freedom to use all major credit cards - Visa, MasterCard, AMEX and Discover! For your convenience, you may select your furniture and take as long as 12 months to pay if your order is $500 or more. Take the total amount of purchase and divide by 12. This gives you the monthly amount to pay for a year. (If you wish a shorter time, divide by 6 and pay this amount for 6 months.) When the total is paid, furniture will be made up and shipped to you. You are guaranteed current pricing and protected against rising costs during the term of your layaway! To use this method of payment, just call our offices today at (866) 410-2755. You will receive a layaway agreement with confirmation of your order and calculation of your monthly payments. *Note: We cannot guarantee a fabric choice or item will remain available during the layaway period. With our interest free layaway plans, you will not be charged interest on your purchases. This is a great pro to choosing layaway! What this means is that, unlike charging your purchases to a credit card, your total layaway cost is the same as the total cost of the item that you have put on layaway. No hidden fees, no interest fees, no service fees, no cancellation fees, no fees! When you place an item on layaway with us, you will not be charged for anything other than the item itself! Layaway provides an alternative to using a credit card to pay for purchases. 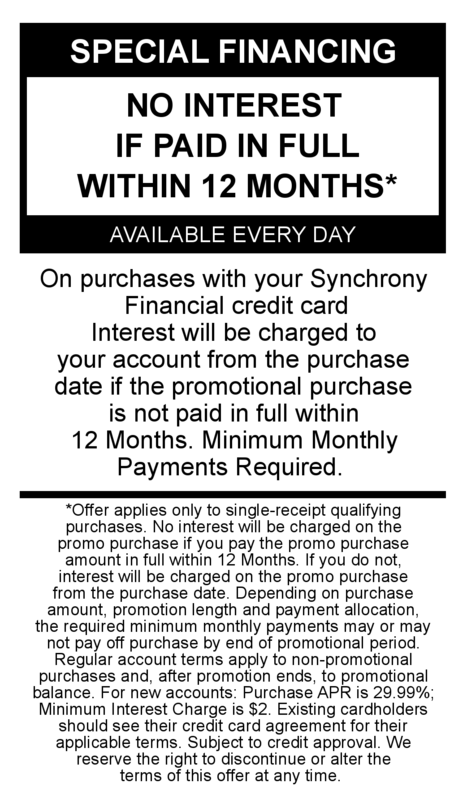 If you do not have a credit card and don't wist to acquire our Synchrony Financial Credit Card, layaway provides another method to pay for purchases over time. If you do have a credit card, but would rather stretch out the payments over a period of time, layaway may be the best option for you. Unlike a credit card, layaway programs do not conduct income or credit checks before approval. To qualify for a layaway you simply need to sign and return our Layaway Agreement as well as provide your first month's layaway payment (see beginning paragraph under this 'Layaway' section to calculate what your monthly payments will be). With this convenient qualification, even people with past credit problems can qualify for a layaway program. Layaway Refund Policy: Full refunds are available within the first 90 days. After 90 days of your first layaway payment your funds are no longer refundable. However, the layaway funds may be applied toward any other merchandise on the MagnoliaHall.com website of equal or greater value.